Kom en ontdek Cosi, een heel mooi licht en rustig Parijse appartement van 30 m2 voor vier personen. Gelegen in Saint-Ouen 300 m van Parijs, aan de voet van Garibaldi Metro, in de buurt van de rommelmarkt en de winkels, zal het ideaal voor uw zakelijk of toeristisch verblijf. Slechts 10 minuten van het Gare Saint Lazare, op 15 minuten van de Opera Garnier en op 25 minuten van Chatelet. Het bestaat uit een slaapkamer, een woonkamer met een slaapbank (zeer comfortabel) en een uitschuifbare tafel, een keuken en een badkamer met douche. Cosi dankt zijn charme aan de parketvloeren, lijstwerk, open haard en het meubilair is zowel modern en klassiek. Het staat garant voor comfort en welzijn aan uw eisen voldoen. The apartment is small and comfortable. There is everything you need. The host is amazing and she lives close by if you ever need anything. She also provided us with Champaign when we arrived which we really enjoyed. I would definitely stay here again. The only down side is there is no elevator so you have to walk up to the fourth floor but it’s great exercise. 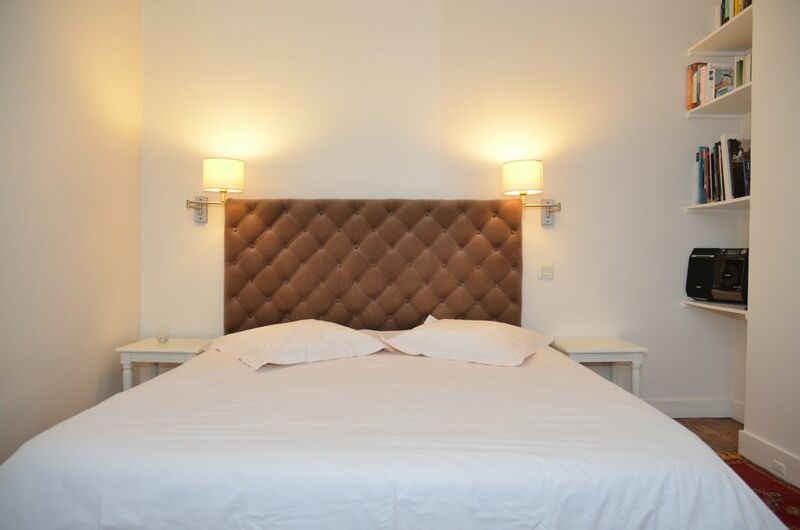 The flat is located in a bustling district with boulangeries, supermarkets, good restaurants and in 5 minutes walk from the nearest metro station, direct line to Champs Elysee. It's light and warm, the radiators work perfectly well. The flat is good size for 2 people. The bedroom is quite large, the rest is on a small side but totally functional. I would suggest a smaller sized table to make more space in the living room. I would also suggest net curtains on the windows. The owners are very pleasant people and Aude was very kind to book a taxi for our return journey to the airport (it takes 20-30 minutes to CDG by taxi and costs about 50 euros). We would stay in this flat again! The apartment was very well equipped, it was we felt right at home, location is great, you have the garibaldi Metro station that connects you with all the metro lines, you also have supermarkets, pharmacies, places to eat, bakeries etc ... overall love it. Aude was wonderful very helpful she was kind help with the luggage. We definitely recommend this flat. Very clean !!! L'appartamento è piccolo ma estremamente grazioso e curato nell'arredamento; pienamente rispondente alla descrizione e alle foto, insomma: accogliente e luminoso. La fermata della metro Garibaldi è vicina e in avenue Gabriel Péri si trovano diversi supermercati e negozi di gastronomia. Ringraziamo i proprietari Bernard e Aude per la loro disponibilità e gentilezza. We enjoyed our stay in this Paris apartment very much. Checkin/out was very easy and the owner was friendly and helpful. Close to food stores and cafes, with the metro just 1 block away. It is very compact and efficiently set up. It is a walk-up with 4 healthy flights of stairs. We would happily stay again. Wir hatten drei Nächte in der Wohnung von Bernard und Aude. Die Wohnung ist wunderbar für bis zu drei Personen, sauber, schön eingerichtet und gut ausgestattet. Würde jederzeit wieder buchen. Lage ist gut - sind nur 2 min bis zur Metro Station.